A group of Industrial Design students from Western Sydney University have made it their mission to help improve the lives of people living with dysphonia. Last year, a chance meeting between Australian Dysphonia Network representatives and Dr Sasha Alexander of the University’s School of Computing, Engineering & Mathematics , provided opportunities that we could only have dreamed of. Sasha’s empathy and vision took his students on a journey of discovery to consider the needs of those who are challenged by a life with dysphonia. This new ‘person-centred’ approach to the study of Design, has helped the students to expand their social conscience and expose them to a new and exciting field of learning. After opening their minds to the daily experience of those affected, they were able to apply their design skills with purpose and meaning…and the results have been outstanding. 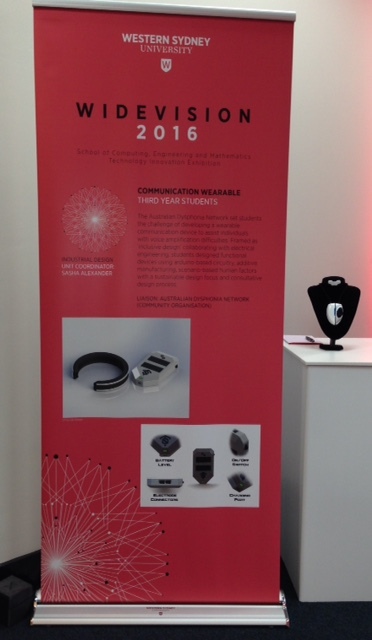 Having been given an initial design brief for a user-friendly, personal amplification system, the students began their background research; arranged industry visits; interviewed potential end-users and contacted voice health professionals. The creative juices began to flow, ideas were developed and within a few months, some very real possibilities emerged. Last night, two of the students where acknowledged for their innovation at the University’s WideVision Showcase. The night is one of celebration, for Students, Academics, Industry Partners and Families, and it highlights the best innovations to come from the School throughout the year. 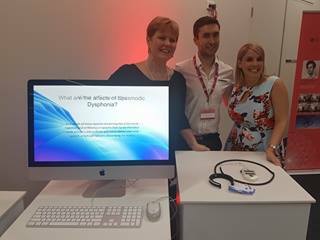 Not happy to stop at amplification, Zac Kirwan (pictured with Ellie and Louise) took his design to the next level by exploring ways to intercept and reverse the errant nerve impulses associated with voice breaks in Spasmodic Dysphonia. Zac’s device will be the subject of further research next year when he works with a team of neuroscience and medical experts to refine his ideas and explore further development possibilities. Harley Arentz (pictured right with Dr Sasha Alexander and Zac) was keen to produce a lightweight, wearable aide which would take the effort out of being heard. The necklace style prototype picks up the vibrations from the larynx and amplifies them through a fashionable speaker which is worn as a pendant. Harley has plans for further research and development with a view to commercialisation if feasible in the future. It’s only just the beginning for these creative young innovators, but proof that anything is possible with the correct encouragement, motivation and creativity. A huge thanks to Sasha and his 3rd year Industrial Design students… you give us hope. If you would like to help the Australian Dysphonia Network to raise funds for research into causes, management and treatment of voice disorders, and help fund further development of innovations such as these…… please donate here.